These customers want the basics. Wired Magazine published an entertaining read about the preferences of public transit riders. The results showed that it wasn’t the technology services like WiFi and charging stations that topped the list of what riders wanted; it was the basics like reliability and predictability of the service. We so often hear the phrase “get back to basics” and this study supports that thought. But the nature of progress and business has a gravitational pull to do more than the basics. We want to add more features and more services. We want to be the most competitive solution provider with more to offer. We provide more service to justify higher pricing. I feel this pull for bigger, better, faster as both a consumer and business professional offering a service. Is all this really important to customers? Back to basics for business planning. 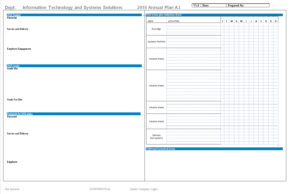 Last year I started using the A3 problem solving approach for annual planning. The output of the A3 process is a single sheet of paper. That’s important to me because it forces my team and I to narrow down our communication to what’s truly important and necessary to communicate with our audience. The Information Technology group is not immune to making problem solutions more complex than they need to be. An approach like the A3 technique creates a framework to get us to think about the basics of problem solving and communicating in a succinct manner that adds value. Here is the template I have used thus far. The process involves documenting prior year results (current state), current year goals, rationale for the goals, action plans to achieve the goals, and follow-up items. 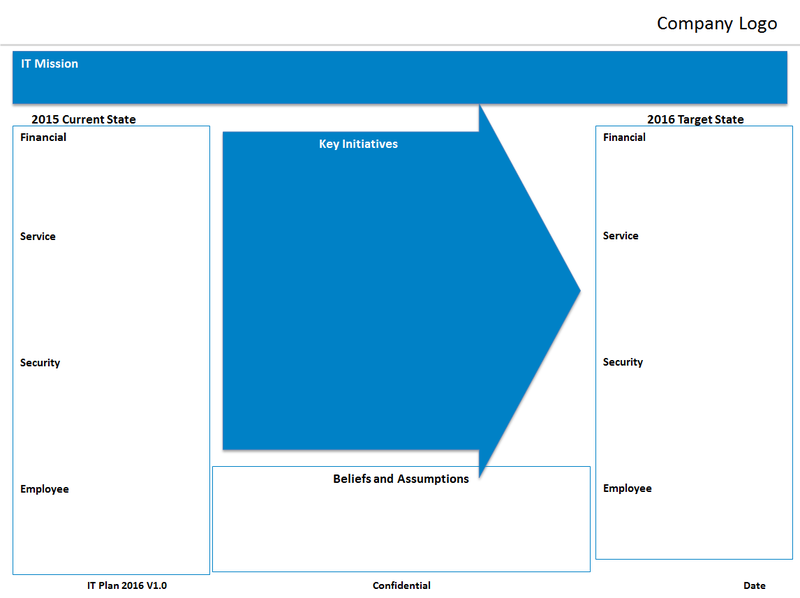 I put the initial plan in an A3 format for discussion with managers and business department heads (suitable to print). Then I translate the plan to a single power point slide for when presentation and projection to a larger audience (suitable to project). 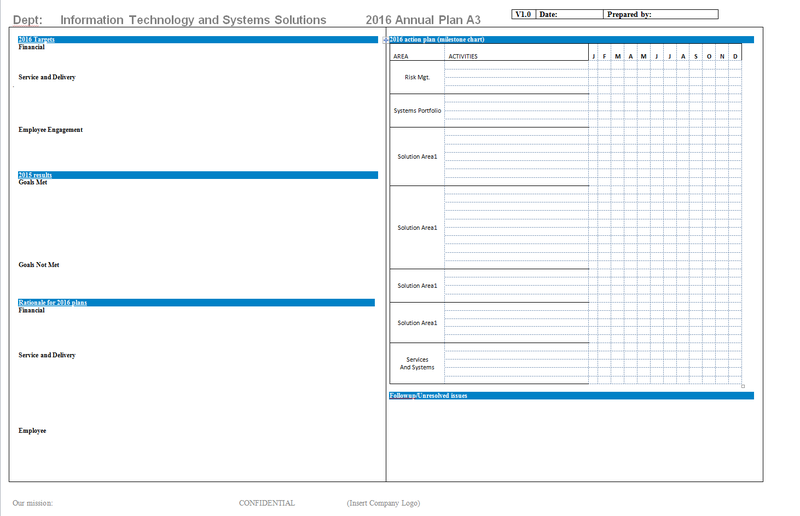 I keep a printed copy of the annual plan on my desk and reference it each week. I use it in discussions with my management team and as part of the performance management process with employees. Monthly I will make updates to the plan with progress on the activities timeline or updates to unanswered questions. Continuous Improvement in business planning. In addition to the annual plan, I’m also starting to think about converting the long range plan to an A3 process as well as my monthly status report. I don’t claim to have achieved an optimal approach to this process. But what is happening is that I’m thinking through the basics of the lean problem solving techniques and how to communicate them with my audience. That’s the beauty of the A3 approach for planning. It creates a conversation with the audience. More than just sending a large report loaded with information that people probably won’t read, this approach gets the conversation to something manageable. « Saying Goodbye to BlackBerry Classic Keyboard!